Successfully Added Android TV Box + Soundbar - 4Kx2K, Android 5.1, Quad Core CPU, DVB-T2, 50 Watt Audio, HDMI, Wi-Fi, Kodi (Gold) to your Shopping Cart. 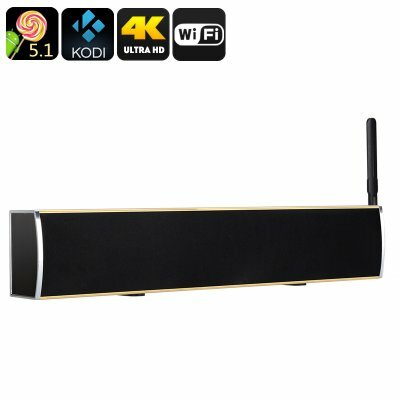 This one-piece soundbar and TV Box brings 4K video support with full range speakers and woofers that offer fantastic audio quality for a fully functioning home cinema experience..
Powered by an Amlogic S905 Quad Core CPU with 2GHz processing speeds and a Mali GPU this nifty TV Box and sound bar is capable of playing games, movies and running all the business apps you require for great productivity and entertainment. Hook it up to your TV and internet for a full home office, media and entertainment system that will bring the family together and enhance the power of your TV. Quick and easy to setup this sound bar connects direct to your TV via its HDMI port brining 4K resolutions and great quality sound to your flat screen TV. The dual 2.5 inch 15 watt speakers along with bass and 20 watt woofer will not only deliver the clear audio your TV can’t, but will turn your TV into a smart TV with access to thousands of channels at your fingertips. DVB-T2 is the Second Generation Terrestrial Digital Video Broadcasting that will let you pick up HDTV signals across 54 to 860MHz so by simply plugging in an aerial you can receive high definition content direct to you TV and its supported in over 20 countries around the globe including South America, Africa, Asia and Europe. This Android TV Box and Sound Bar comes with a 12 months warranty, brought to you by the leader in electronic devices as well as wholesale TV Boxes and home entertainment systems..